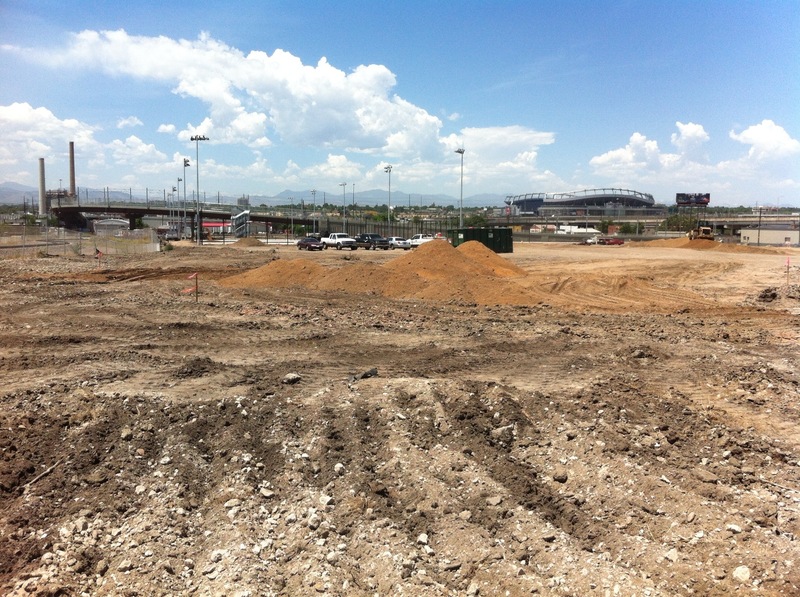 If you have ever wondered about how the La Alma Lincoln Park neighborhood was built and developed as part of Denver over time, this post should offer a few insights. Some of the most informative records we have are embedded in the lines and markings on maps and drawings. With many structures lost to flood, neglect or progress, these visual records offer a wealth of clues to the past. 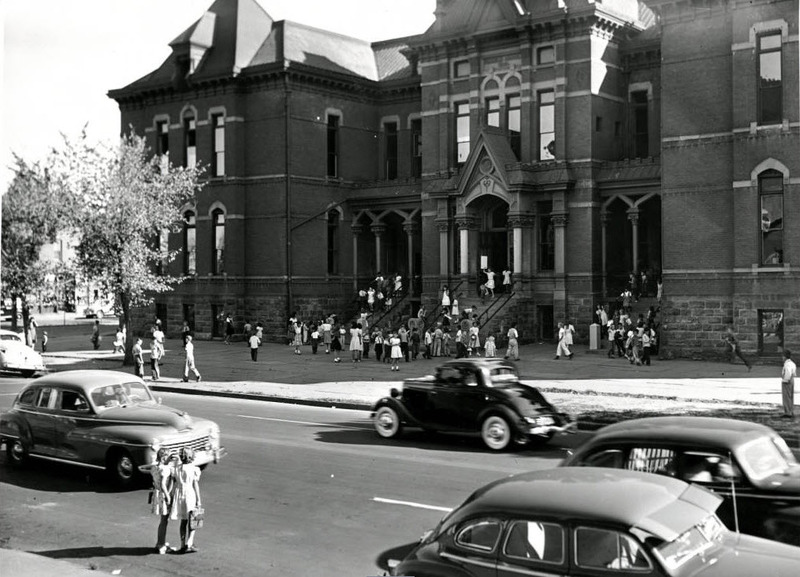 They also help to represent the legacy of the lost architectural gems, and bring more to light about the historic character of the neighborhood. However, because Denver experienced periods of great growth and speculation, publications are not usually 100% accurate. Buildings may have been built or destroyed before the cartographer’s research was distributed. Records are only as good as the people or circumstances that created them. Just as the deed to our home indicates a build date of 1890, the Denver Directory suggests the residence was occupied as early as 1885. It has been most productive to think of these documents as providers of clues or supporting evidence for hints already uncovered. 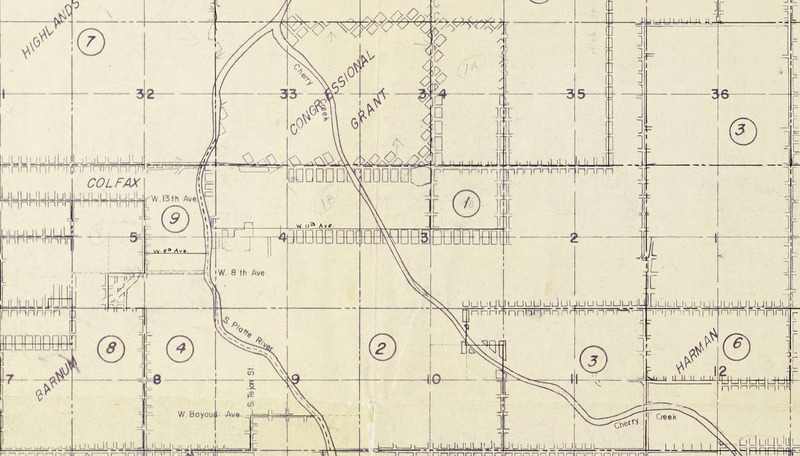 Most maps show the first Congressional Land Grant stopping at Colfax, excluding Lincoln Park from the original Denver City boundaries. The map and key below would support the notion that A C Hunt, known to be present and involved in the earliest machinations of government here, worked to improve his homesteading claim across the creek. The land was included in the first legal expansions to the city limit. 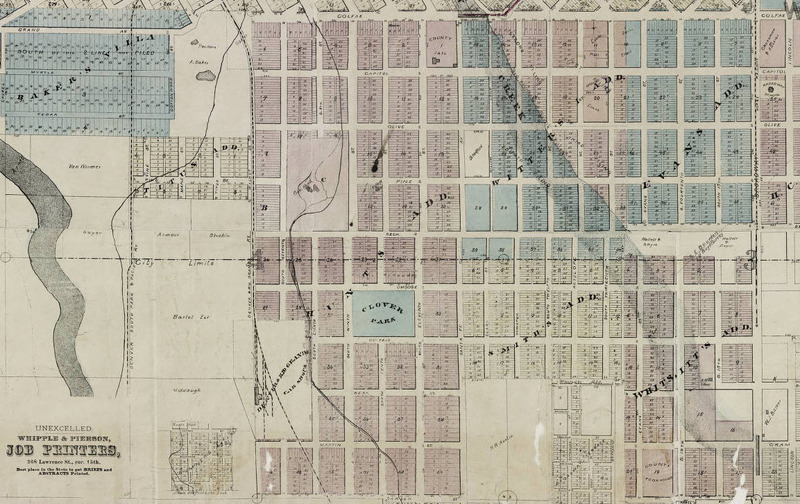 According to this document, part of Lincoln Park was first added to Denver down to about 11th Street in 1875 (Area1 on the map), and the rest of the neighborhood was included by action of the state legislature in 1883 (Area 2). 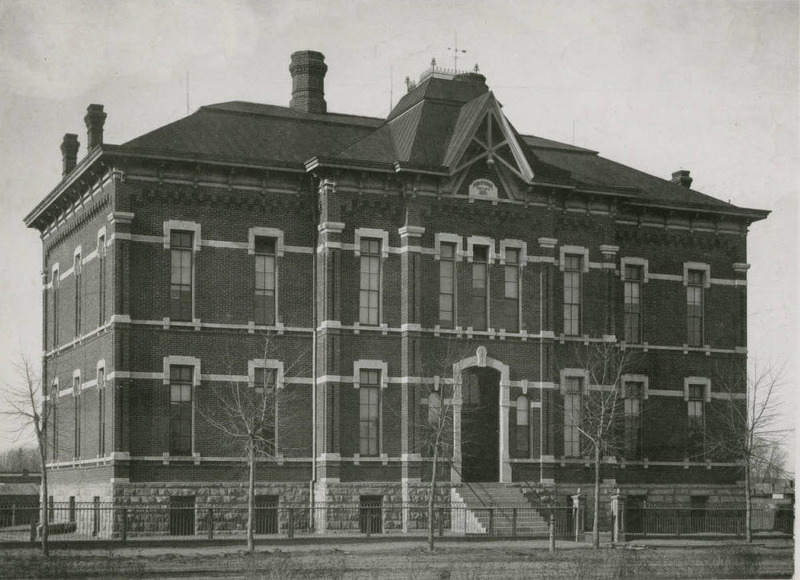 Another annexation does not occur until 1889. Aside from the Hunt homestead and Camp Weld, Lincoln Park didn’t really made it to the map until the 70’s. 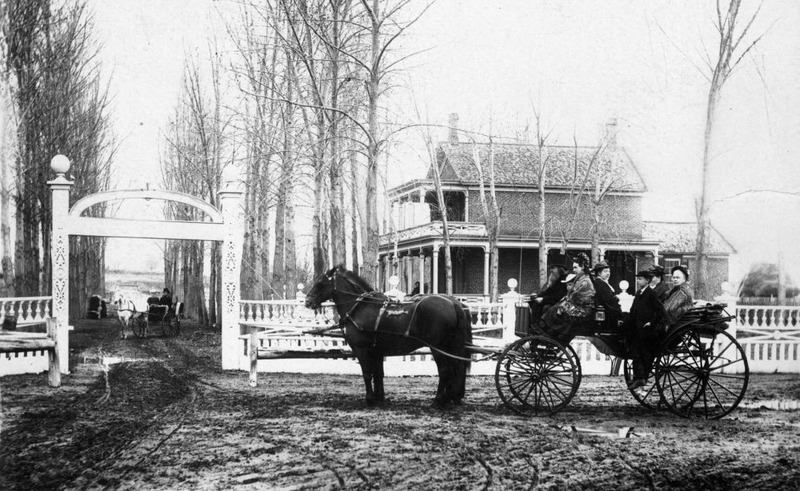 After the Denver & Rio Grande laid it’s track through part of Governor Hunt’s property, the railroad offered the jobs that stimulated this neighborhood’s development. 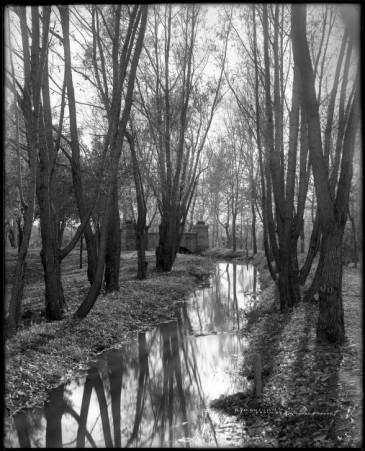 Although the floods would devalue this land across the creek, it would become a home to many of Denver’s working class citizens. We can also see more clearly, the line of the first annexation mentioned above. The “City Limit” runs between Deer and Moose, about a half a block south of Eleventh St. today. 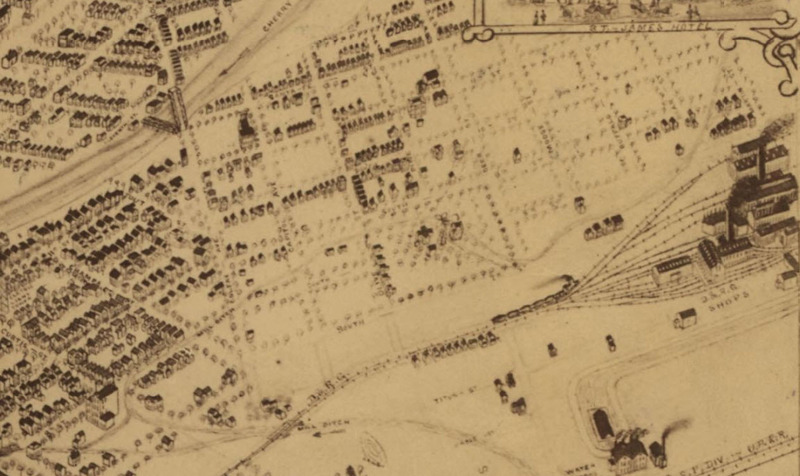 Also visible here: Clover Park, A C Hunt’s house, the first County Jail, and County Poorhouse. 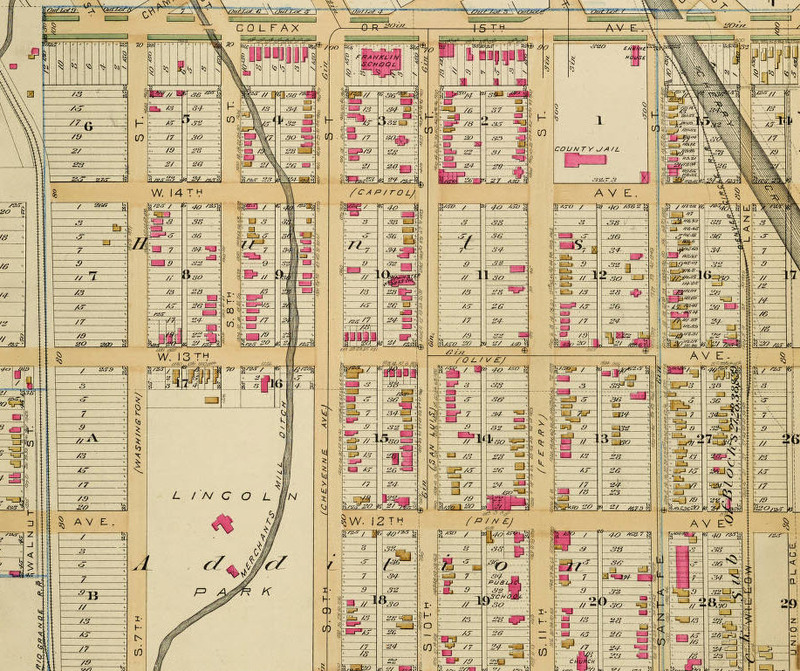 In these early maps, we definitely see the progress of plans to build up the area, as well as the historic subdivisions that comprise today’s larger La Alma Lincoln Park neighborhood. Besides Hunt, readers may recognize Witter, Smith and Whittsitt from the eastern half and Baker, Titus, and Milleson west of the tracks. 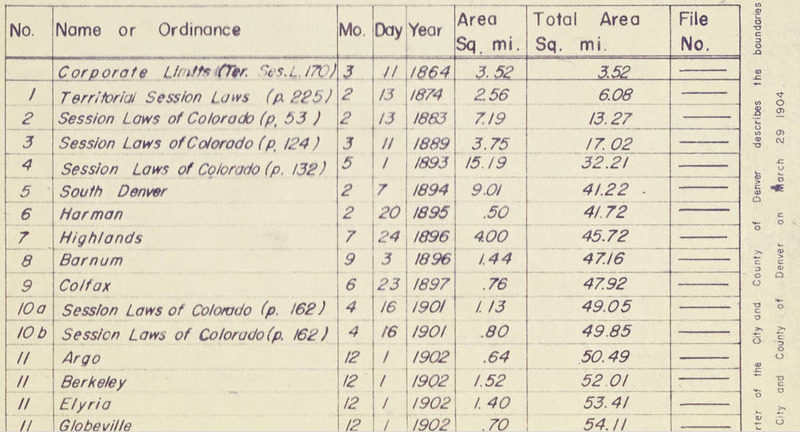 Homeowner’s may have noticed that their property record likely corresponds to one these pioneer developers, homesteaders, and city builders. 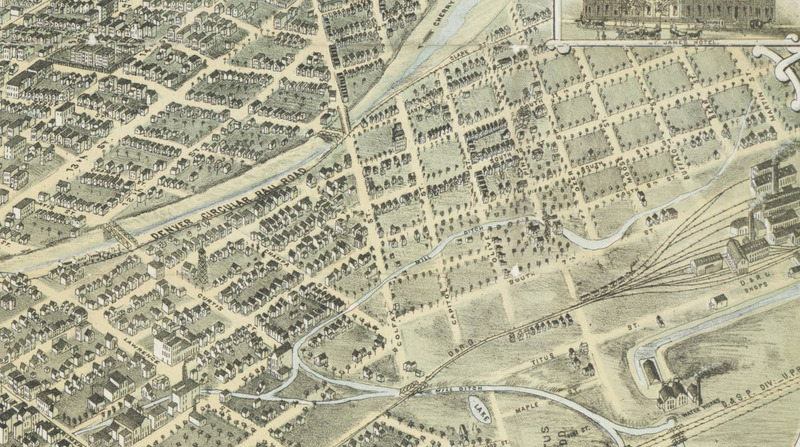 Interestingly, Colfax Avenue did not always run so far to the west as it does today, with Grand Avenue starting west of the RR tracks and the Excelsior Mill Ditch at Curtis Street. Much thanks to these artists, whose birds’eye perspectives offer the best depictions of our fair city in the early years. While the southwestern part of town is often on the edges of or excluded from these images, cropping and zooming can capture more detail than apparent at first glance. 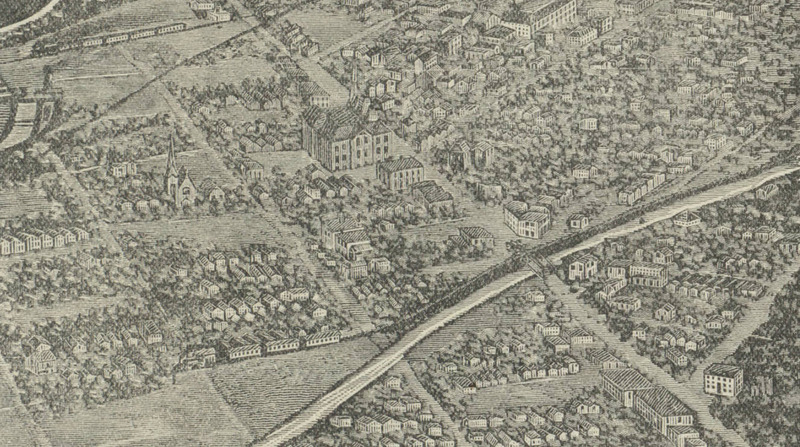 This one from 1881 offers a snapshot of the settlement’s outskirts, about twenty years after Denver’s start. 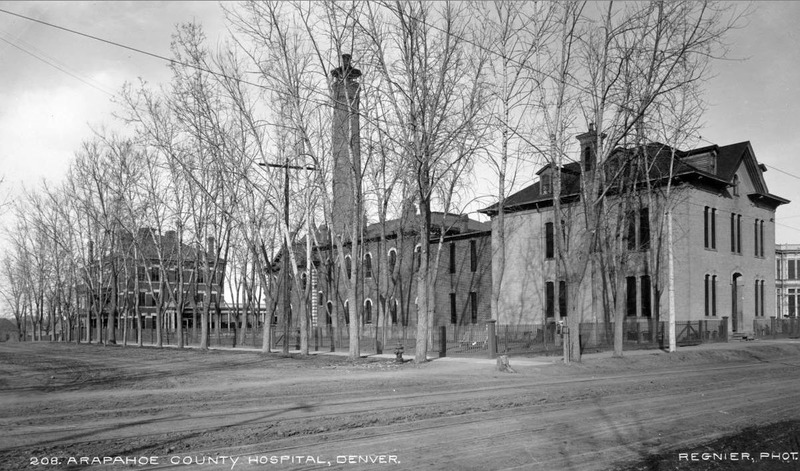 Again, Hunt’s “Cloverside” in today’s La Alma Lincoln Park, and the County Jail at 14th and Santa Fe are seen. There are long-gone homes on the northern edge of Hunt’s homestead, along today’s 13th St. in today’s park. 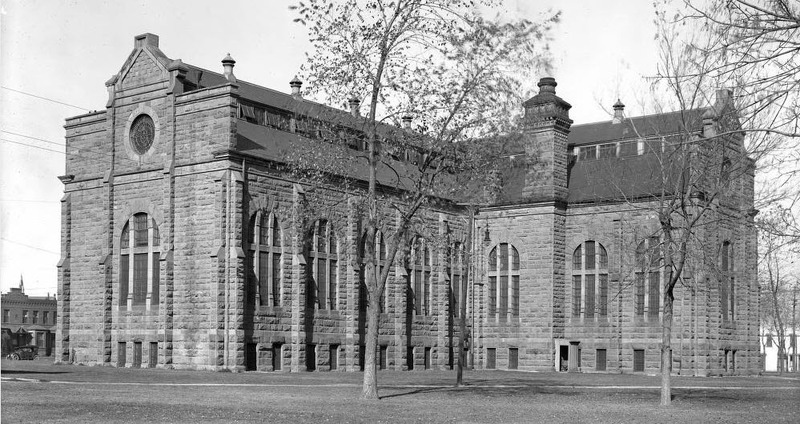 The Central School is visible on South Eleventh (Kalamath St.) and the newly built church that still stands today on 11th St. (Deer) appears. The “Three Stone” buildings standing today on Denver Water’s campus are here and the D&RG shops are drawn with some good detail. A different crop adds more context to the development of the neighborhood and city. It is uncommon to see how Grand Ave actually tied to Auraria at Curtis and Larimer, and joined with Morrison Road after crossing the South Platte River. Villa Park would later obliterate that connection. Whatever inaccuracies these renderings may display, they certainly paint a vivid image of an early stage in the neighborhood’s development. Did you notice the Denver Circle Railroad’s tracks running along the Cherry Creek bed before heading down today’s Inca Street? This map was used for the promotion and development of Villa Park. 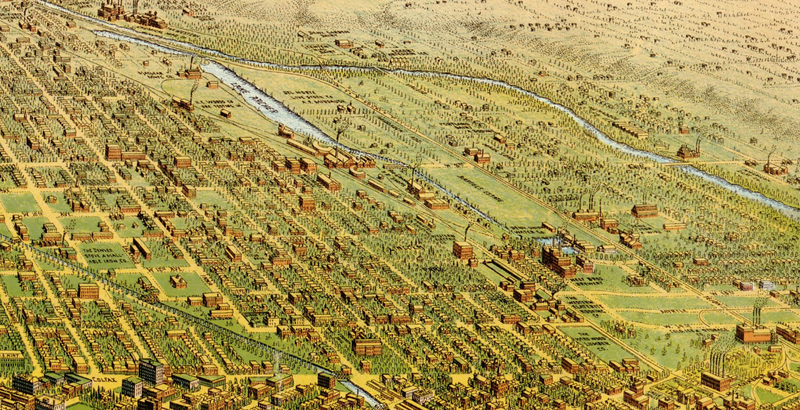 It elaborates on the growing network of streets, railways, and canals, and illuminates how quickly Denver was growing. Most significant to neighborhood history are the track route of the Denver Circle RR, Lake Archer, and the Denver & Rio Grande. 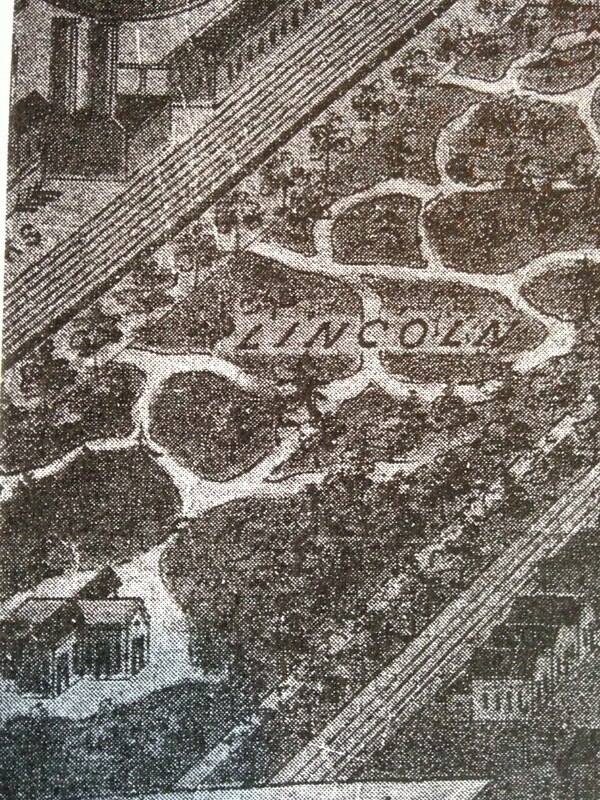 We can still see Hunt’s house in what would become “Lincoln Park” in 1885. On several maps, we see the landholdings of Nathan Addison Baker stretch from the Platte to the D&RG tracks, just south of Colfax/Grand Ave. Readers may remember Nathan from Baker Spring’s role in our water legacy story. 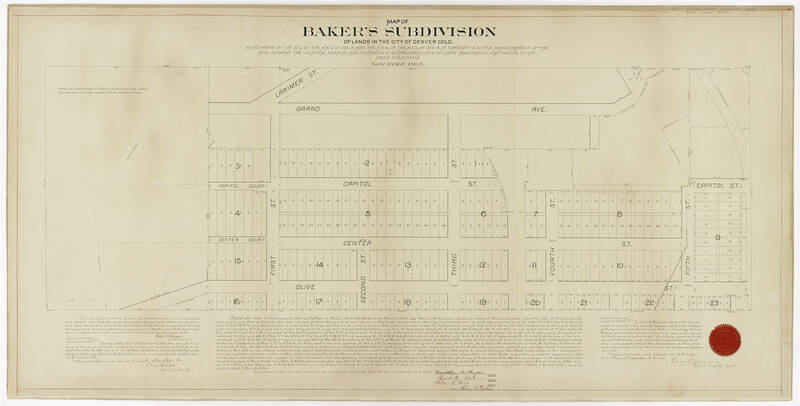 Upon his death, Baker’s heirs planned to follow through with the development and the survey map above describes the subdivision in detail. Other maps show a residential character did once exist there, but perhaps most interesting, is how altered the landscape actually became. 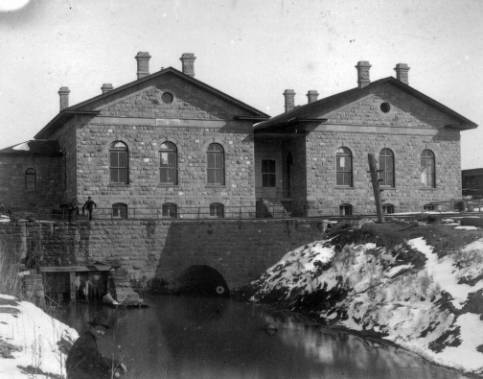 Numerous floods washed all the houses away eventually and the area between the railroads and river/highway eventually became much more industrial, and separated from the rest of the neighborhood. The area is today receiving renewed attention with MSU’s new athletic complex rising and long neglected lots attracting interest from residential developers. This birdie was flying from a new direction. 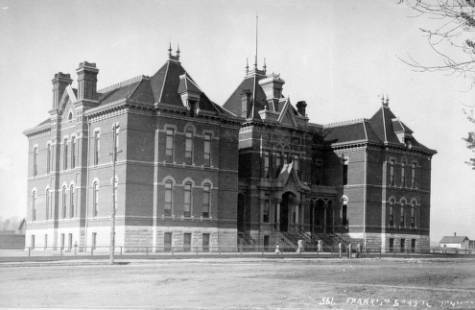 It offers depictions of the Denver CIrcle train in the foreground, and the grand Franklin School on Colfax. The citizens of Clark Street (Inca St) fought the noisy train running down their street for many years until the track was abandoned in 1898. 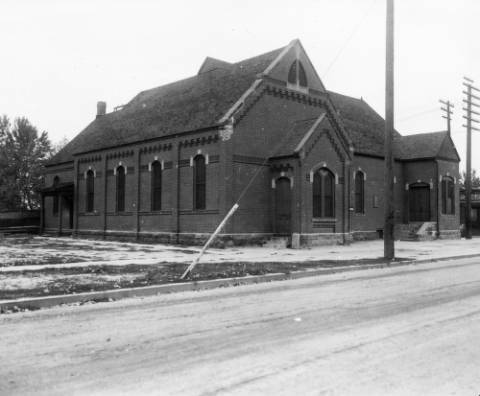 And, West Denver’s first high school stands tall in this landscape, while a long gone church also pops out from today’s 1300 block of Lipan St. behind it. 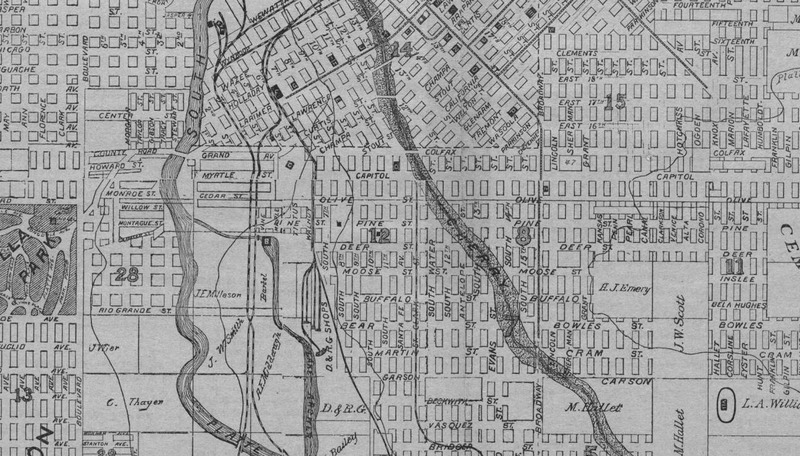 This surveyor version of the same area from 1887 starts to show which homes were built and establishing “Lincoln Park” as a thriving “West Denver” neighborhood. 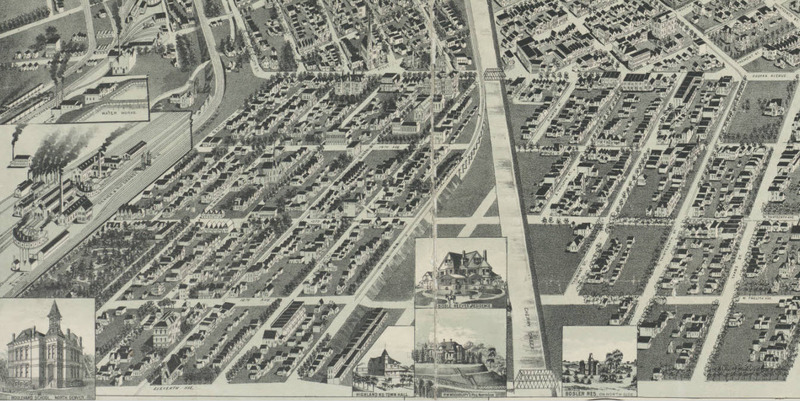 The first drawing is like many found, cluttered with other images that conceal the full picture of the Lincoln Park neighborhood. But, the crop from an alternate version does add the best rendering of the looping paths leading to the Hunt home that once covered the land. 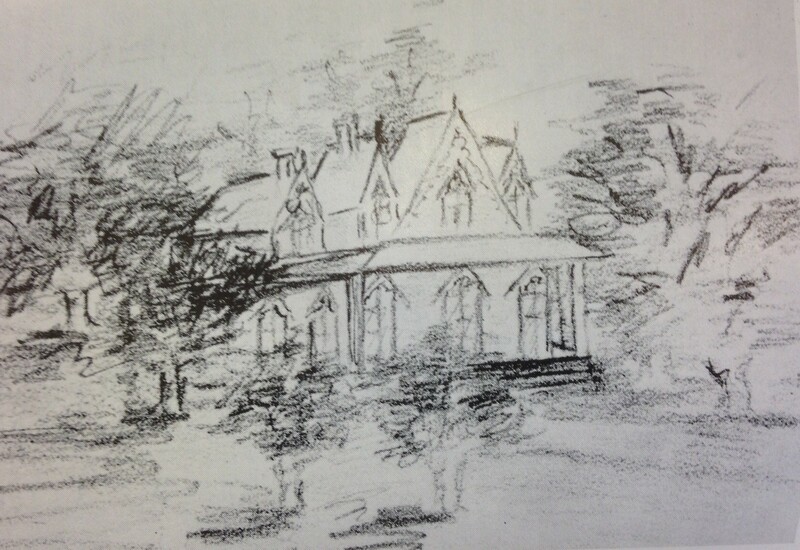 Rendering of Hunt’s Homestead Visible. Source: Silver Images of Colorado, Ronzio, Richard A. From reading these maps, many of the houses we live in today were already built as the century was coming to a close. 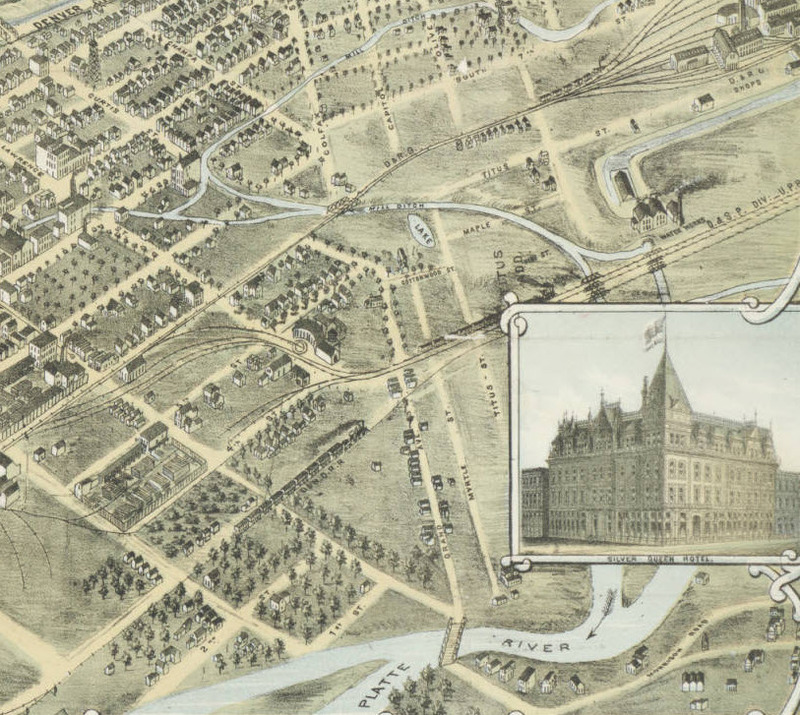 Both the1889 drawing and the 1905 map below show significant growth and impressions of a few more lost landmarks. We can see the outline of the the “new” jail, and at least three churches that no longer stand in the neighborhood. 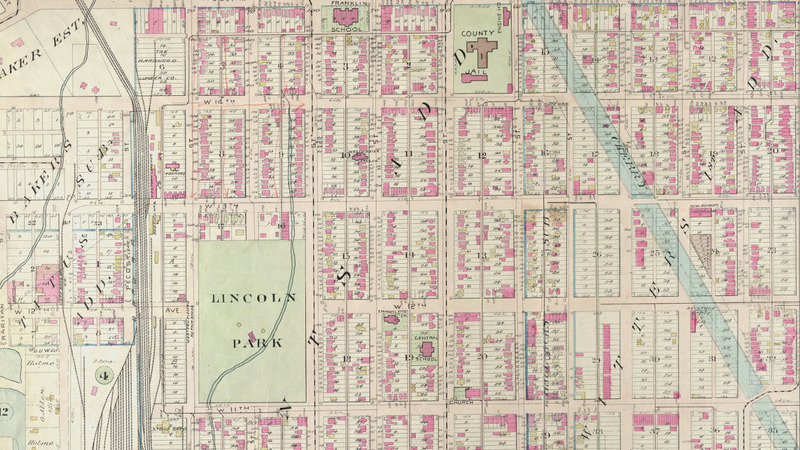 Look closer at Lincoln Park and see the outlines of over a dozen houses built along 13th, within the boundaries of today’s park. Did you notice the streetcar lines on Mariposa, Kalamath and crossing the Cherry Creek at 11th? 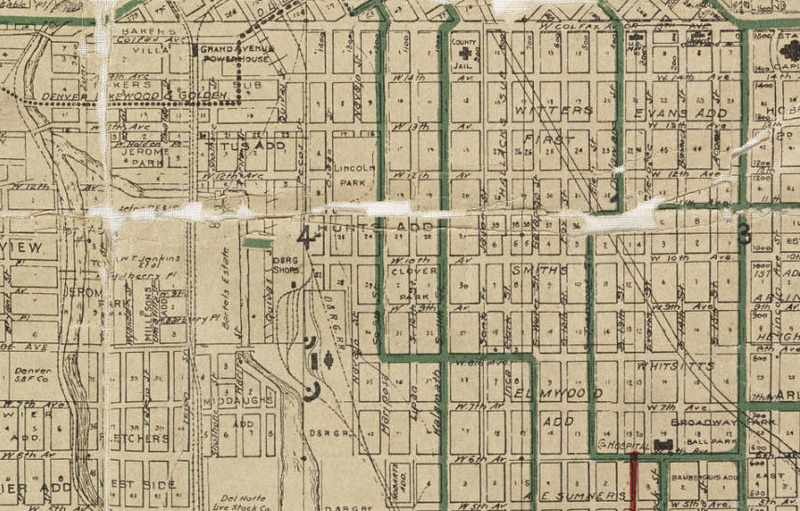 You can see the lines more clearly on the Denver City Tramway Map from 1906, as well as the Grand Avenue Powerhouse. 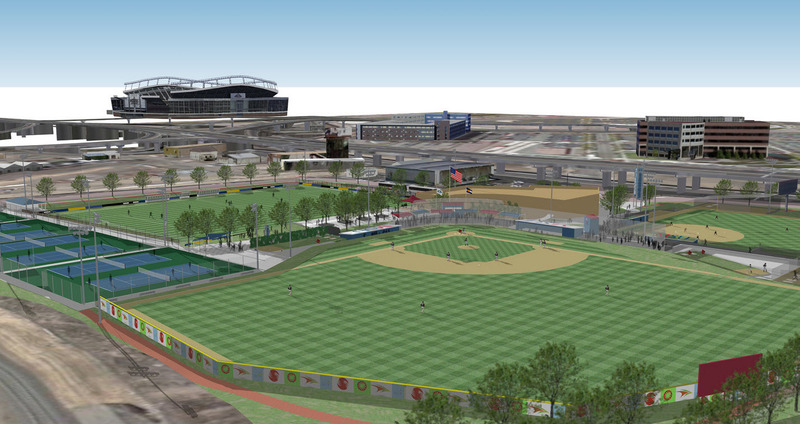 In the southwest corner, the hospital and city baseball field are shown. Both Jerome Park (once residential, west of tracks) and Elmwood’s Addition (at southern boundary) are visible below. These final images offer a lot of clues about the development of the neighborhood, and how much residential architecture has been erased by a hundred years. Fortunately, you can trace many structures still standing today to those represented on the map. 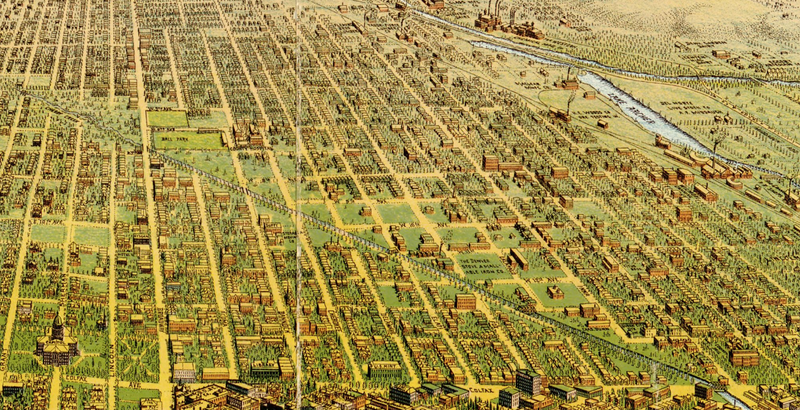 They show how Lincoln Park’s waterways and railroads attracted industrial uses and impacted the neighborhood’s evolution. 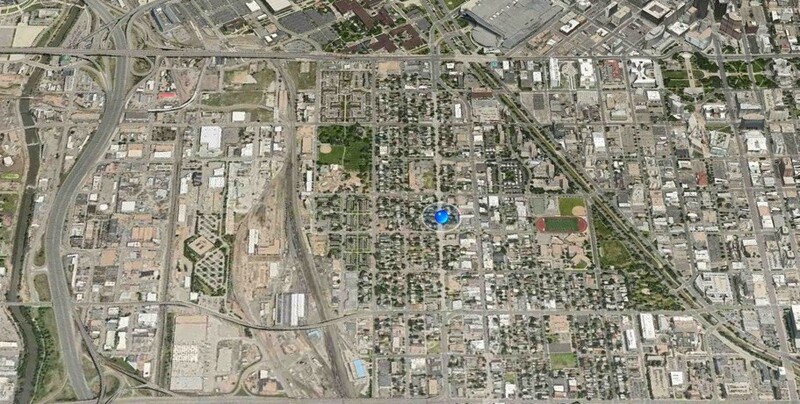 A few visible landmarks: Neef Bros Brewery, the new Jail building next to the Firehouse at Colfax and Santa Fe, Denver Water, County Hospital and a city baseball park. 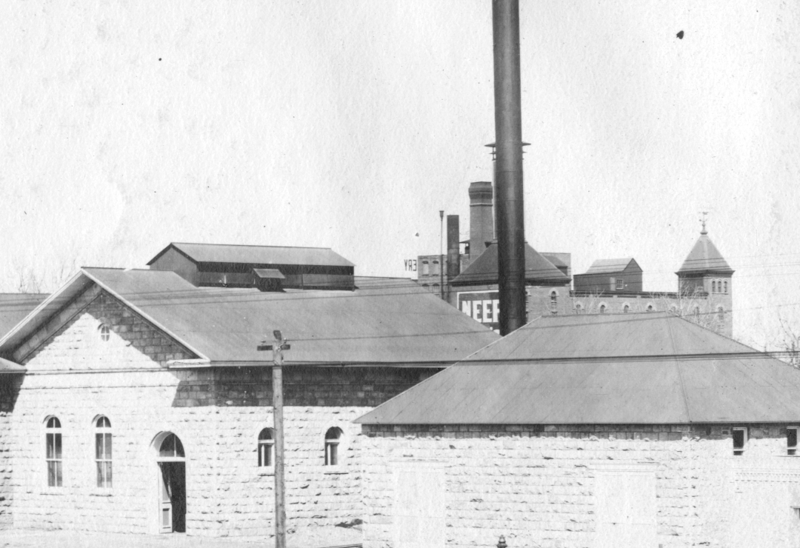 Denver Water’s pipe yard, zoom in on Neef Bros. Brewery, Courtesy of Denver Water Archives. I just added a sidebar Gallery on the home page titled “Lost LandmarKs” that should be helpful to reexamine this timeline. Have fun, Lincoln Parqueños.